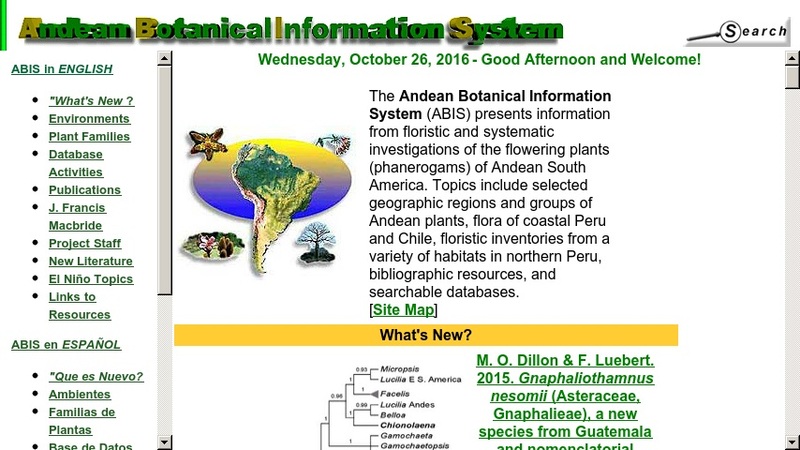 The Andean Botanical Information System (ABIS) provides information about the flowering plants (phanerogams) of Andean South America. Materials include information on the environments of the Andes Mountains and a gallery of images of plants (by family) distributed in the Andes of Peru and Chile. There is also information on a research database that provides access to collection-label data of South American Andean plants for taxonomic purposes. The specimen-label information from over 7500 collections from coastal Chile and Peru have been electronically captured and are available in checklists. Other materials include a biography of J. Francis MacBride, who performed groundbreaking research on the flora of Peru, a bibliography of additions to the Andean flora, and information on related resources. The site is available in both English and Spanish.